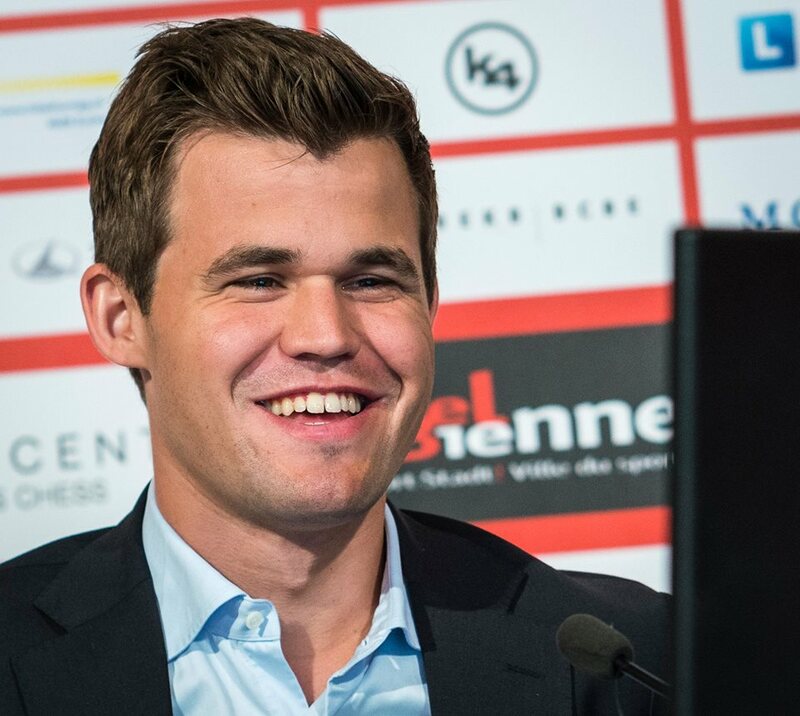 Two very different wins left Shakhriyar Mamedyarov and Magnus Carlsen as co-leaders of the 2018 Accentus Biel GM Tournament after the first round. Shak needed only 28 moves to wipe Nico Georgiadis off the board, while Magnus had to work hard to win after David Navara misplayed his position. 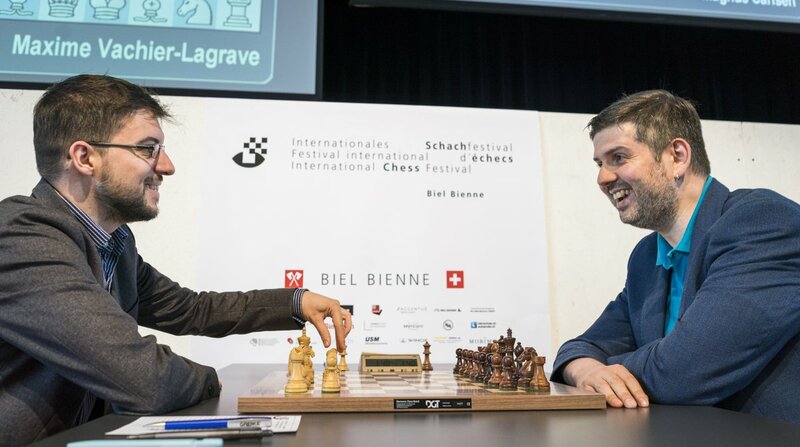 Maxime Vachier-Lagrave and Peter Svidler drew. 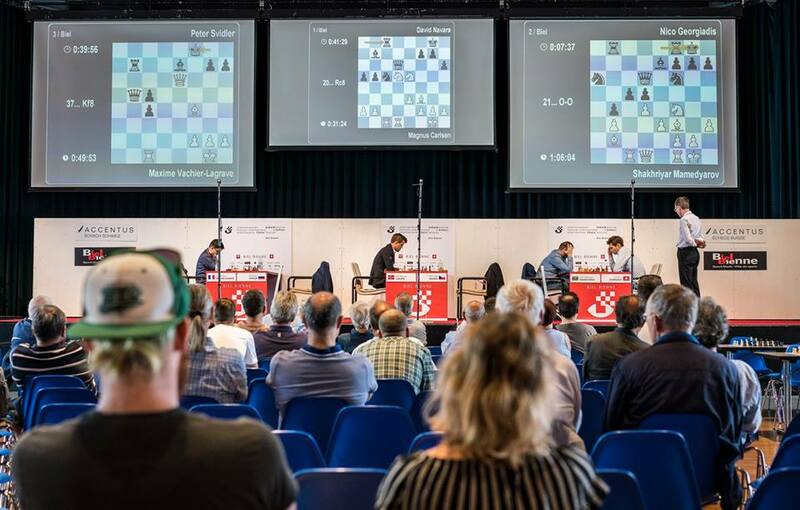 The Biel Chess Festival organizers decided to give 22-year-old Nico Georgiadis the chance to play with some of the strongest players in the world, and the drawing of lots resulted in the Swiss grandmaster having to face Mamedyarov and Svidler with Black in the first two rounds. In the first game, he had a sort of "baptism of fire", as he was quickly surprised in the opening and couldn't ward off a devastating attack. According to chess24's database, the highest-rated player that arrived in this position was Viesturs Meijers (2493), and none of those who got here continued with 8.Rc1. Shak declared that he expected this position, and that he had prepared it thoroughly. It clearly worked, as Georgiadis spent no less than 15 minutes before going for 9...Bg4. After the game, Shak confessed that he already felt he was better at this point. 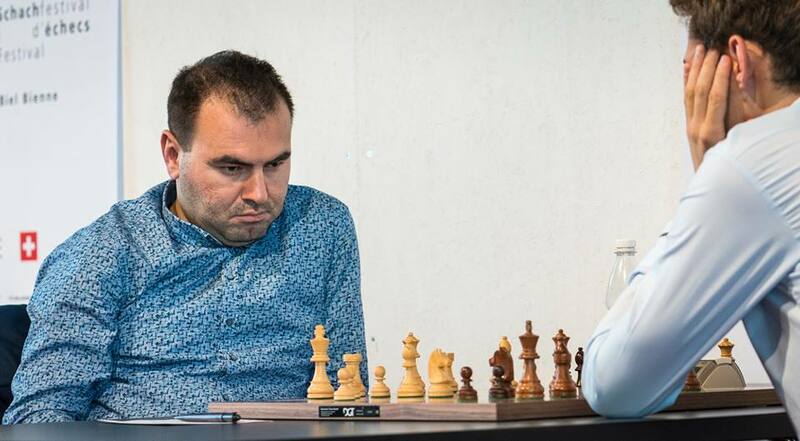 A quick first round win seems to be a good omen for Mamedyarov, who had solid performances in the two classical events he played after the Candidates (50% in Shamkir and -1 in Norway). Curiously, when asked about his rise in 2017, he said that his motivation was the Candidates Tournament, as having a clear goal helped him focus his energy on chess. Now, on the other hand, he will try to play more freely, without thinking too much about his rating. This game followed a completely different script. Black should have come up with a careful plan to advance on the kingside if he wanted to go for the win. Here, White followed with the obvious 46.Nf6+, getting the h-pawn. From this moment on, it was clear that White was the one who was going to push during the rest of the game. After 59.Rf5+, Black is forced to give up the queen for the two pieces, and White has a winning pawn endgame. Five moves later, Navara resigned. Two years ago, the Biel Chess Festival did not have a round robin tournament but a match that faced these two players off against each other. The French number 1 won that event by a clear 5.5:2.5 after defeating Svidler in both the rapid and classical sections. The previous time I tried this I had a losing position by move 20, so I thought I should try to prevent the same thing happening again. From my viewpoint, I'm a lot happier about what I did today than what I did in Saint Louis when we played this line for the first time, but I'm still not entirely sure why I'm subjecting myself to this all the time. He has a plus score against Magnus, he shouldn't be afraid of anyone. The Biel GM Tournament is a double round robin, so we will have ten days of action (Saturday will be the only rest day), all starting at 14:00 CEST. Don't miss the action live here on chess24!